Even when reduced to a mass consumption, school dinner, kind of experience, travelling by boat should still have a deal of romance attached to it; maybe even a taste of adventure. The search for the room and the fist thump checking of bunks and pillows should add rather than subtract. The view from the window, rounded at the edges but not really a porthole, should be far more interesting than the view from a car. There should be places to explore and things to discover. There should be deck quoits and leisurely strolls before retiring to a cabin for drinks and nibbles. Reality bites as I brush the rice off my chair to sit and eat my one price, all you can eat dinner. Fear of a rough crossing and the prospect of becoming reacquainted with my food at a later date takes the edge of my appetite. Some people clearly do not suffer from such apprehension and feel the need to make the most of the one plate offer. The boat kicks up clouds of mud and silt from the floor of the bay. Silver gulls haunt the turbid water, looking for food, fighting for air space. Small shudders pass though the whole boat as we start to move. The combination of sensations makes the boat feel like a slightly unstable shopping centre. Much as I hate to say it, the whole thing is vaguely unpleasant and I am pleased to get back to the cabin. We select bunks and I turn in for the night early. It’s clear I need a holiday; something to sluice away the end of year deadline stress. Something to press the reset button. Somewhere. Almost anywhere. I sleep fitfully, as if the anticipation of relaxation is causing stress itself. In the morning, I can see Tasmania sliding past the window – the town of Devonport on the Mersey, a kind of mixed metaphor of colonial history and memory. The near passes quickly, the distant more slowly. My brain suffers from a kind of parallax as well, like it’s running at two speeds; I can’t put down work yet, even though I want to pick up the holiday. My head hurts. I’m pleased to have arrived in Tasmania, and even more pleased that Sal says she will drive. Under an opening blue sky we head west. My head is fogged in a way that the view is not; I close my eyes. Slowly the fog lifts. Slowly I unwind. Slowly the holiday clock takes over. It’s a relief. Tasmanian Native Hens feed by the side of the road, running through the vegetation with comic strip energy. Even my foggy brain can see the humour and value in these birds. A Wedge-tailed Eagle floats over the road, looking for food less active than the Native Hens. In Tasmania such road kill is never far away. By 10 am we are almost five hours past breakfast and in need of fuel. The adults select coffee, the kids, biscuits. Neither helps the five (or is it nine) serves of veggies a day count. Frankly, I don’t give a damn. We are still on the north coast of Tasmania, the coast that faces the mainland of Australia. We are yet to turn south to meet the west coast, with the cleanest air in the world and views that show the curve of the Earth. Tasmania sits below the southeast corner of the Australia, hanging like a little goatee beard from a hipster chin. It’s island off an island status makes it different from the rest of Australia; making it feel more isolated than its continental cousin. Bass Strait, windy, storm driven and studded with dozens of islands, separates Tasmania from the mainland and allows it to exist in ways that are different from the mainland. Tasmania has a different scale to the rest of Australia – smaller distances, smaller towns and a landscape that creates grandeur from detail, rather than intimacy from isolation. These are not bad things. The bends in the roads and the happenstance discovery of isolated pubs, give the place a feeling of England, yet the shapes of the trees, the colour of the leaves and the animals on the sides of the road are resolutely Australian. It is a place to summon unexpected memories, misplaced but powerful, as well as a place that presents the new at each corner twist; a powerful combination of the seemingly familiar and the plainly new. As we move further into the day and further from our drop off point the sights on the side of the road change. The Native Hens seem to disappear. The grass becomes longer and the road kill fresher. Disappointingly this is how we see our first Tasmanian Devil. Heavy set at one end, with sharp pressure point teeth at the other. A black body, the size of a large cat or a small dog, with white patches, bloodied in death, curled by the side of the road. This may just be the loss of one individual, but it is a loss none the less. For all the greenery, for all the soft and welcoming looking places hidden behind hills and in the watery necks of valleys Tasmania has become a graveyard, rather than a sanctuary for the Devils. As we drive on I hope it’s not the only one we see. Forests. Grass plains. Edges and distant views unbroken; but also damaged land, hollowed by mining and cut by saw. Open coops, caught with tree stumps and sometimes piled with the unwanted brash of harvest. Uniform replanting, blue gums maybe, fenced and restrained. Eventually we step off the made road and on to the less certain surface of gravel and stones. The road is pale and crystal rich, made from the spoil of a local mine. The crystals sparkle in the sunlight, dampened by the slight rain that fell before the Sun came out. Stones rattle-tick onto the wheel arches of the car, and the voice of the tyres changes from the dull roar of the tarmac to a less predictable, scatter chat, tune. Small washouts and potholes rattle the car and bounce the view. The change feels like a passage to somewhere a little more wild. It feels like you have stepped off the map of the everyday and into a world of greater possibility and surprise. It may be an overstatement, but as we leave the tarmac it feels like the holiday has begun, and all that went before was just travel. We head west and south. Despite the evidence to the contrary it feels like we are going downhill. We head towards the sea, but you wont not have known it. The road stays unmade, rough and loose enough to be thankful that the engine pushes all four wheels. Such a reaction may be more a product of clever advertising than real need, but the rattle snick-snack of gravel on the car plays on my mind and I am glad of our consumer choice. Eventually the road enters woodland, close grown and damp. Some say tigers still live here – striped, pouched and thick tailed, hiding in the darkness. My head reaches a different conclusion to their presence than my heart, but both know we are about to enter the realm of the Devil. Even though it’s broad daylight – in a cloudy sort of way – I keep expecting things to bounce out of the bushes by the side of the road. A few parrots and smaller birds, like wind blown leaves, rush across the road, but little else distracts from the task in hand. We head down hill, past roughly cut road signs and over clatter loose wood plank bridges. A sign, half clothed in moss and fallen twigs promises we only have 200m to go; and it does not lie. The small village of Corinna – although that’s not the correct word, but none seems to exist – appears suddenly around a corner. The trees step back from the road to create a small open space, and a single and long abandoned petrol pump acts as a town marker post. Low slung buildings, mainly wood with tin roofs and soft red brick chimneys pop from the grass. 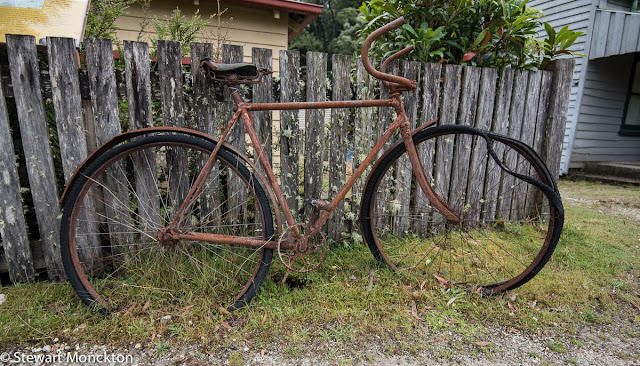 An old pushbike leans against a fence, and two fishing rods lean on the bike. 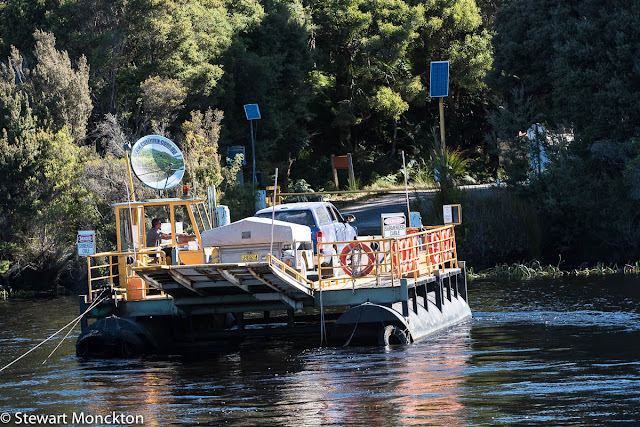 The road ends at the Pieman River, where a ferry waits for onward travellers. Corinna probably still exists because of the ferry. A bridge over the Pieman would encourage you to keep moving, to push on towards the south-western wilderness, but now there is a reason to stop and stay. The river still acts as a temporary barrier, less formidable than in the past, but a reason to stop none the less. A man, who from his voice I know to be Scottish and a lady, who I take to be French, meets us. Their status as a couple remains a point of contention for the length of our stay. We are pointed in the direction of our small house with the kind of relaxed efficiency that acknowledges that five minutes really does not matter in the scale of a whole day. 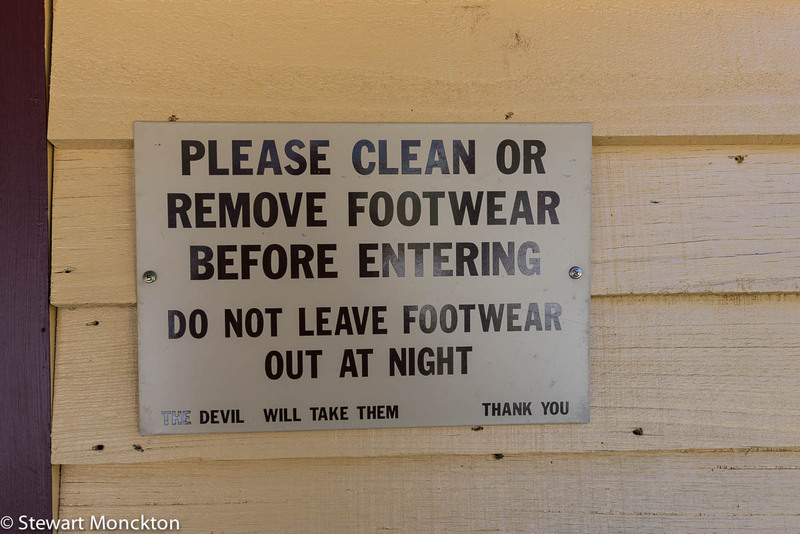 A notice outside the front door warns us not to leave our boots outside over night, lest they be eaten by the Devils. A note by the back door could have alerted us to the minefield of wallaby droppings beyond and the presence of sun-worshiping snakes. Such information suits my way of thinking far better than the reams of paper advertising pizza and burgers that you find in the more sterile places of the world. Devils to the front, snakes to the rear. Splendid. Corinna only survives because people stop. Once it was a mining and logging town, extracting the bones and flesh of the region that is now called The Tarkine. Today the people who stop probably look for other natural wonders. 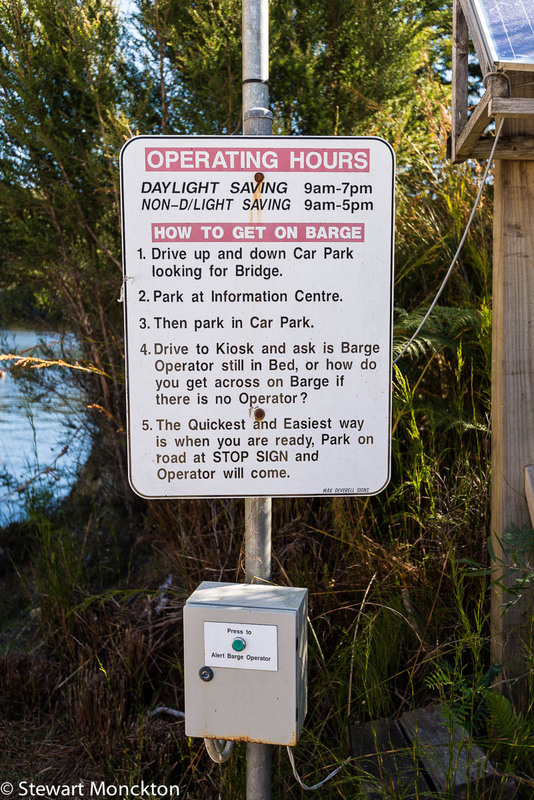 The Pieman River acts as both a destination and barrier, and because we stop it becomes the focus of the next few days. If we had been able to pass over the river with little more that a short period of increased caution, we would have tried to spread our attention far and wide. But as it is, we stay put, and use the river as both an attraction and a conduit. With steep banks coated in tall trees the river gains protection from most winds, so it lies flat and undisturbed, and shelter can always be found if the wind does catch the surface. It’s clear that the rain is not far away, but the morning seems to offer some promise; the afternoon forecast makes me wish I had an open fire before which I could toast my toes. The scrape of plastic canoes over gravel sets my teeth on edge – although it’s markedly better than the sound of aluminium Grummans (oh, the memories!). With the dynamic design of a cheap bathtub, these canoes are wonderfully stable; the idea family boat. We head down stream, towards the distant sea, a convoy of two – a boy’s boat and a girl’s boat. Slight twists of vapour rise from the water in the chill of the morning air. Ducks take flight in fright at the bright coloured boats and the far carrying voices. It’s been a while since I paddled a canoe. Soon I feel the familiar discomfort of kneeling with just the edge of the seat providing support. Plant the blade, pull back straight and let your top hand drop. Twist your fist out and down to turn the blade and the push away. The ABC of a J stoke comes back; surprisingly fluid and smooth. The boat moves forward in a series of regular shallow curves, pushed one way, pulled back the other by the movement of the blade in the water. 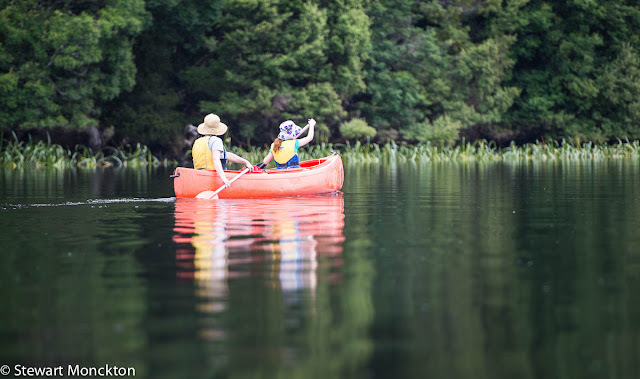 Straight lines in a canoe seem largely mythical. Little whirlpools of turbulence form behind the boat – making it seem like the boat is still and the water moving; only the shifting perspective of the trees clearly shows that we are making progress. The water is glassy still and its perfect surface makes the tiny showers of rain that defy the forecast look more serious than they really are. Paddle bubbles, formed by over eager blade strokes, mix with others that rush to the surface from the deep water. It’s tempting to think of fish or the clumsy legs of giant crayfish – but chances are it's just decomposition and swirling waters. But the fish fantasy is much more enjoyable. After a while The Pieman is joined by The Savage River, and we head up the tributary to look for the wreck of the SS Croydon; Australia’s largest freshwater wreck – a claim to fame that smacks of desperation. It sank on the 10th of May 1919, a popped hull plate thought to be the cause. The best part of 100 years has left little above the surface, but below the tea coloured water you can still see wooden boards, handrails and open hatches, all furred with silt. A quick sweep of a paddle blade lifts clouds from the boards and metal, the dead boat rising in the water like a ghost. I imagine the flanks of silver fish brushing through the sunken boat, the slow rot of wood and rust of steel. A kingfisher flashes down the river, a strike of electric blue. A heron, all stillness and patience, stands by the water’s edge, awaiting the chance to strike in a different way. From the low water vantage of a canoe, the world comes to meet you. 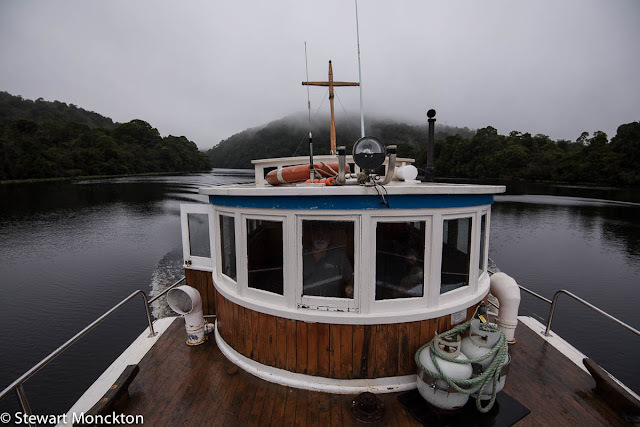 The next day, under gun metal skies, we tour down the river in a veteran old lady of a boat. Built from a fine, honey coloured timber called Huon Pine, the Arcadia II was build in 1939 and has had a variety of jobs – today she carries tourists up and down the Pieman. There was something reassuring about the clear and obvious craftsmanship that had gone into this boat. While the world sat at the edge of war, somebody took the care to shape and mould wood so that the handrails on the steps fitted perfectly into the palm of your hand. At the mouth of the Pieman was a small settlement, reachable by land only by a long and rough track. Many of the vehicles that had made that journey were sitting in various states of decay around the small houses – some would say shacks – that were half hidden by the remaining vegetation. The buildings were often painted in bright colours, blue being very popular, and were almost universally adorned with found objects and home made signs. Only one building seemed to have a resident – a man, maybe in his 60s, maybe much younger, but just weather beaten, sitting on a rough wooden bench with large cup of tea. He did not return my greeting. I suspect that if I had waited long enough I would have heard people playing banjos. The beach that overlooked the ocean was paved in sections by greyed, river washed tree trunks. Some looked to have escaped from the grasp of loggers, with square cut bases still bearing the mark of saw and axe. Most were twisted and broken back to a semblance of nature. All have been delivered to the beach but the force of the Pieman and the downhill pull of flooding water. 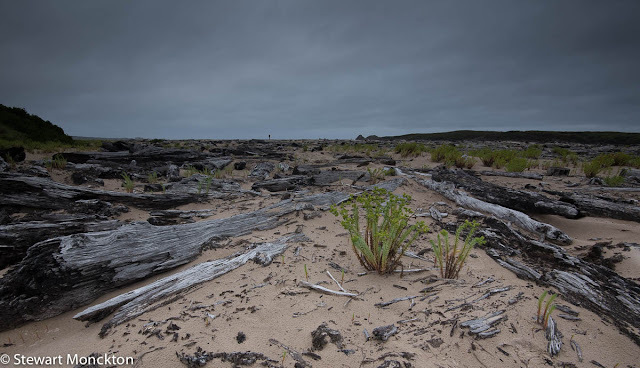 It was a place where the illusion of wilderness was strong – although the presence of beach weeds and recently abandoned fire sites said otherwise. Some wild, but tiny, creature managed to bite me in a dozen or so places through the legs of my trousers; the bites raised to little red wheals that itched beyond the measure of their size. In the end, only long sea swims, or a pre-dinner whiskey could dull the irritation. Beyond the beach edge there was nothing and everything. Far enough south to skip the tip of Africa so they say and then collide with South America. Maybe half a world in a single view, and maybe a place where you could see the curve of the Earth. The Crows Nests of coming ships growing into view before the solid and walked decks. A place to take in the sea air, longer over water than anywhere else on this watery planet so misnamed as ‘Earth’. A place to wonder at the wildness that existed here before rubber boots grew on trees, before the sound of boat motors came loud on the wind and the before the click of camera shutters became a proxy for memory. On the far bank of the river, high in the trees, two pale patches resolve into White-bellied sea eagles. My thoughts on the return journey are full of wildness and wilderness. 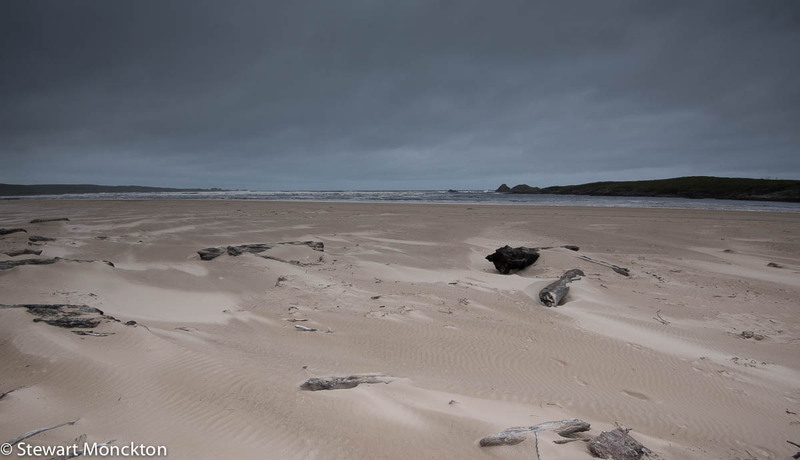 Full of the fitful movement of wind blown plants and the slow accumulation of sand. That night I dream of an open ocean and a deepening sea. We had hoped to see platypus in the Whyte River, a tributary of the Pieman, but we were becoming concerned that in a while we would not be able to see the path. A slowness of travel, or a miscalculation of distance, meant that we were deep into dusk when the lights of Corinna started to show through the trees. This was something of a relief. The hub of Corinna is the bar, restaurant and shop that sits just before the road ends and becomes a river. A veranda wraps around two sides of the building, both with views towards the river, making this a great place to plan for tomorrow and an even better one for a beer at the end of the day. Finally we got to play a few games of quoits, and the evenings were punctuated by the tick tock of table tennis games. Father and son games, where I now have to concentrate like never before, as day-by-day H’s head slow creeps past my shoulder. As I return a shot, I notice movement in the darkness of the car park below. A patch of darker darkness detaches itself from the shadows and moves with a rolling gait into the slight light of the open spaces in front of the ferry. “Devil” I call, maybe a little too loud, dropping the bat as H returns the ball (he claimed the point). There are few places in the world where you can see Devils and not be in the grip of some form of religious fever. The dark shape freezes in the middle of the car park and seems to be waiting. I raise my camera, more in hope than anticipation, and hear the focus hunting back and forth, searching for some form of certainty to lock on to. All it finds is darkness. I take a shot anyway. 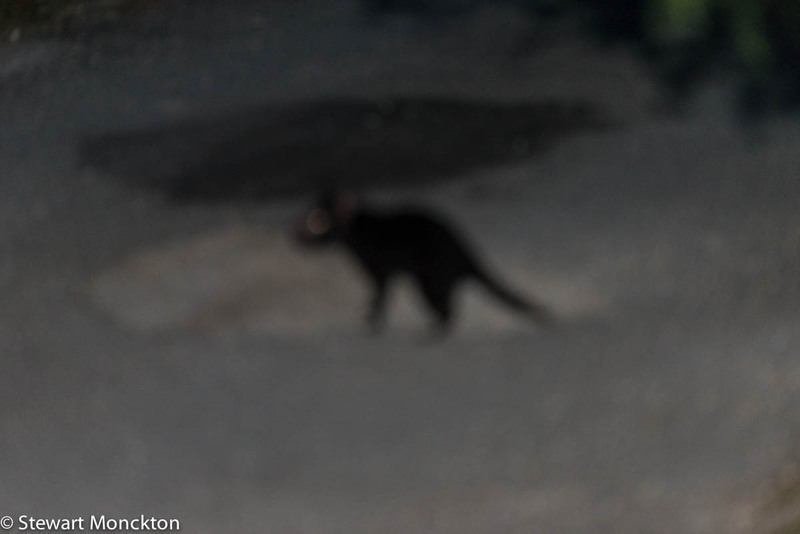 The devil, which by its size is a young one, moves on through the car park, skilfully avoiding the few pools of light that may have given me some hope of focus, and pauses to sniff the night air. There is no question that it knows I am there. Even if my scent was masked by wood smoke and cooking smells, I know that I am being observed in the downstream air. The devil enters the dark shadows of the scrubby woodland and disappears. It seems to merge into the darkness rather than leave it. It’s like a state change, where it went from one form of hidden to another one. When you see things like this, it’s not hard to imagine where tales of shape-shifters and magical animals originate. And across much of this island state a similar, but far more profound kind of shift is robbing the Tasmanian wild of its last large carnivore. A facial cancer, fatal and specific, has spread through the population of Devils like wildfire. Strange in its passage, and unknown in its origin, it has reduced the Devils to near extinction in many places. Only on the West coast do they remain even common. And what is saddening is that we don’t really know if this is due to isolation or due to some difference in these Western devils that keeps them safe. If it is just isolation, every day brings a real threat that whatever barrier keeps the cancer at bay will be breached and this last stronghold will also fall. Now, any of you who have had the misfortune to deal with cancer may be cocking an inquisitive eyebrow here. How does a cancer spread like this, from population to population? That’s not how it normally happens. But this cancer is not like most others – it spreads by contact between the Devils. When a Devil with a tumour bites another, there is a chance that some of the tumour cells will be transferred to the healthy one. Once in the healthy Devil, the cancer cells can begin to grow, to gestate like some parasite, until the tumours that form around the Devils face prevent it from feeding and it starves to death. But even this is not the end of the strange story of this cancer. The immune system of animals is exquisitely tuned to the chemical markers of their own cells – the markers of self. The immune system can detect which cells are its own, and which are foreign. So, if the cancer cells truly were a parasite, the immune system of the Devils would detect them and attack them. But by some other chance of history and genetics Devils posses very little variety in these chemical markers of self. So, the cancer cells go unchallenged as they are passed from Devil to Devil. The immune system is blind to the threat, only finding cells it sees as self; cells that would normally be safe, cells that are meant to be there. Cells that won’t kill them. If this cancer takes the Devils and drives them to the same fate as the Dodo and Passenger Pigeon, then the wilds of Tasmania will have lost something unique and special. If the cancer means that Devils can only survive in zoos and sanctuaries, then they will be diminished and so will we. As I look into the sundered darkness where a Devil once stood, I hope they will remain and persist in the wild. But knowing where our priorities lie it’s not easy to be hopeful, and it’s not hard to have sympathy for the Devils. A great post and the ferry instructions are the icing on the cake. That's quite a trip! Thanks for not posting photos of the road kill! What a beautiful account of your trip. I didn't know the Devils were faced with extinction from cancer or that cancer could ever be spread that way. I love the atmosphere your "shot in the dark" evoked along with your words. I love the shot of the devil!